For more than 60 years, the Hammond Bay Biological Station has been the hub for Great Lakes science, sea lamprey control, and restoration. The Great Lakes Fishery Commission and U.S. Geological Survey partner together, through a Memorandum of Agreement with the USGS Great Lakes Science Center, to jointly manage and operate HBBS. The commission provides funds required for Hammond Bay station personnel and operations and the science center supervises Hammond Bay scientists, handles administrative matters, and hires and oversees employees. The commission and the science center collaborate and reach agreement on all significant aspects of the research program and direction. The commission provides an annual funding contribution to conduct research on Great Lakes ecology and its relationship to the invasive sea lamprey, investigations about innovative sea lamprey control technologies, and other studies related to the Great Lakes fishery and ecosystem. Discovery and synthesis of sea lamprey pheromones. Collectively, these achievements - and others - have resulted in one of the most successful invasive species control programs in the world. All together, the sea lamprey control program has slashed sea lamprey populations by 90% in the Great Lakes basin. 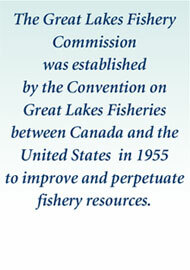 The control program underpins the economic and ecological driver that is the world-class $7 billion Great Lakes fishery. The U.S. Geological Survey's science complements the commission's mission to support sound science that guides ecosystem restoration. In addition to serving as the hub for sea lamprey control research, the Hammond Bay station serves as the base of operations for the commission's acoustic telemetry projects and the USGS' Deepwater Research Program, which investigates the status of the forage base. Research conducted under these two umbrellas greatly contribute to scientists. understanding about fish populations, the state of the ecosystem, and the impacts of various changes, such as a new invader, to the system. The station, staffed with a bi-national group of scientists, is among the most productive research facilities in the Great Lakes basin. While there are only about 15 permanent employees, the station hosts an additional 25-30 visiting scientists, contractors and technicians, and nearly 40 students (undergraduate, graduate, post-doctoral) each season. The majority of the commission's Partnership in Ecosystem Research and Management (PERM) scientists use Hammond Bay facilities to conduct their research that is so critical to the commission's mission. 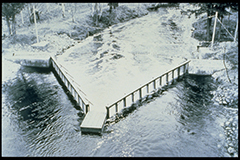 [Visit http://www.glfc.org/eforum/article6.html to learn more about the PERM program]. Over the past several years, HBBS has undergone a substantial transformation. Recent funding from the U.S. Geological Survey nationally and from the commission has made possible the purchase of new research equipment, vehicles, boats, and the much needed rehabilitation of office and storage facilities. These upgrades represent a serious commitment from the United States government to support this international research facility. The bright red roofs on either side of the facility shown in the photo above are the new structures. These changes have greatly improved the working environment for HBBS staff, as well as creating space for new and visiting scientists. 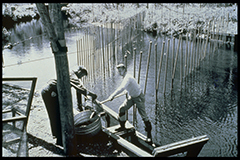 Electric wiers (top) and mechanical barriers (bottom) were some of the first attempts to prevent the migration of sea lampreys during spawning season. These were developed at HBBS.